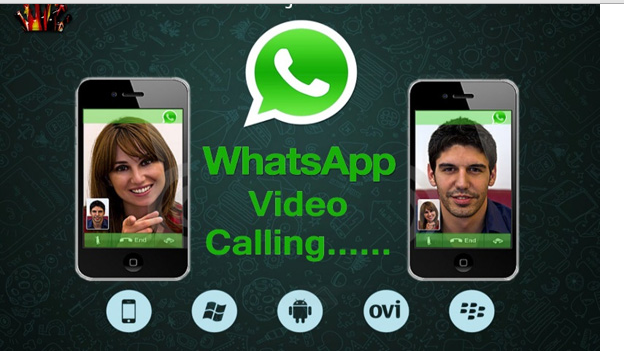 Hello Readers, I Know you are searching for Video Calling Features in whatsapp. You try to search on google and try to find it. There is no wonder people Search Whatsapp Video Calling Andriod Apk as whatsapp is making everything realise. Don,t you have whatsapp in your Mobile download Whatsapp here Easily. Just Download & Install it. We Know that in starting there is no audio or video call features is available but now whatsapp enabled voice calling feature since last 1 year but now whatsapp going to lauch video calling feature in their andriod/iOS app. Its really true that we get Video Calling Feature in whatsapp in the nearby future. WhatsApp, the world’s best instant messaging App has reached a new milestone of 700 million active users and the number is increasing for each passing day. Recently WhatsApp released Voice Calling feature for Android Gingerbread, Honeycomb, Jellybean, KitKat and Lollipop versions and later it also released WhatsApp voice call feature for iPhone users as well. But the only need is that your iPhone must be jailbroken. You need to install the latest version of WhatsApp on your smartphones to get this Voice Calling feature enabled. Visit WhatsApp official web site or Google play store and download the latest WhatsApp version in the range 2.11.561. To 2.12.7 and install it. WhatsApp voice calling feature for Windows Phones, Blackberry Phones and Symbian Phones is yet to be released. Among them, may be Windows Phones will get Voice Calling feature earlier than others. If WhatsApp is to release Voice Calling feature for Windows Phone then it can be only through the new Version of WhatsApp for Windows Phone. If that is the case, we can expect the PC/Laptop Version of WhatsApp for Windows 10 too. Then there is a facility to install WhatsApp as an app on Windows 10. There are some rumors that WhatsApp is building its own app compatible with Windows 10 or windows 8.1/8 or windows 7. If that will come true then we will definitely get WhatsApp for PC/Laptop. Of course you can now use WhatsApp on your Windows PC/Laptop by downloading and installing Android App Player BlueStacks for Windows 10 or Windows 8.1/8 or Windows 7/XP. The procedure is very simple, and you can find it in Download and install BlueStacks for Windows 10 or Windows 8.1/8 or windows 7/XP and use Android Apps on your PC/Laptop. The competitor of WhatsApp, Hike will be releasing Voice Calling feature in the next two months for its users. A report from Maktechblog shows that WhatsApp is going to enable Video Calling feature for Android and iPhone users. WhatsApp Video Calling feature for Android and iPhone will be enabled via Skype. WhatsApp by integrating the feature of Skype will give a unified look as WhatsApp Video Calling feature. So, likely In nearby future whatsapp get video calling features. Bu this feature you can do a video call like skype , it really an amazing . This feature is going to appear as ‘Call via Skype’ option in WhatsApp so that we can have a facility to make video calls with our loved ones. If that possible that in future there is no competitor available because now whatsapp is a king of messenger , and after activing video call feature , no one can competite it.